January was a very heavy month for me investing wise. In total I invested in two new companies (Imperial Tobacco and Old Mutual) and added to an existing holding (Interserve). These investments were also bigger sums of money. this was due to my goal for this year to cut back on the value of my charges incurred during trading this year. As a result, I invested much more in the month than I ordinarily would have done. This left me with little "excess" cash for February. With my early month--and again sizeable--purchase of Royal Dutch Shell I thus expected the rest of February to be a very quiet month indeed. However, this has not been the case. As if to test my frugality to the limits I have once again chucked another larger than usual amount of cash into a new holding. this time it is the multinational utilities company, National Grid. 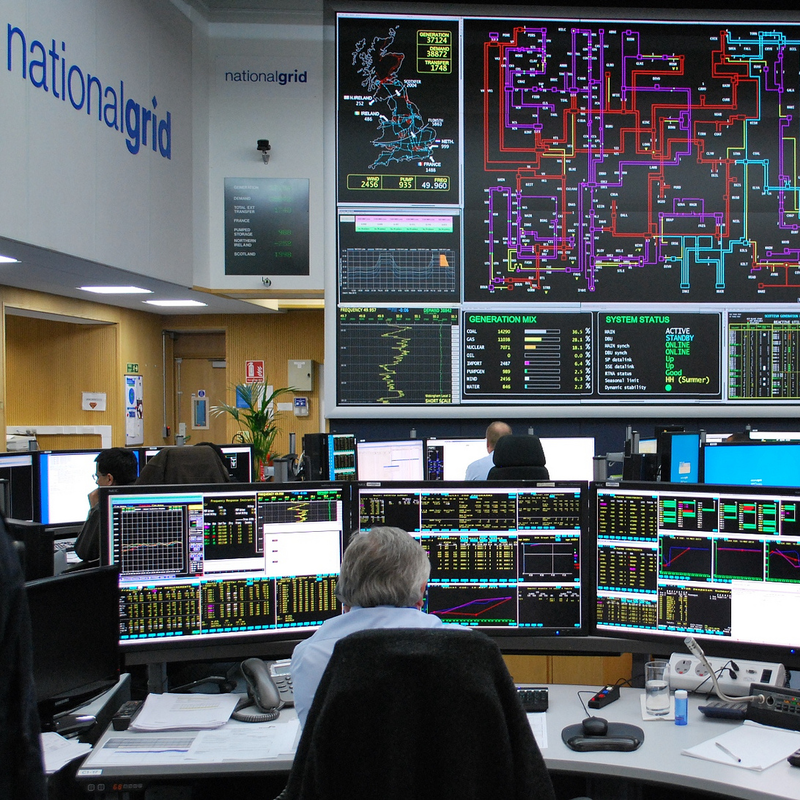 I have been watching National Grid for some time. I had considered buying into the FTSE 100 giant in January 2014. In the end I plumped for the fellow FTSE 100 utility, SSE. Since then, National Grid has seen its share price continue to relentlessly climb higher and higher. Still keen to add NG to my portfolio, I thus had to sit patiently for a price dip to coincide with some free capital. Why do I like the National Grdi so much? Well, to me it is an ultra-defensive member of an already highly defensive industry. In the UK most of its revenue and profit is derived from its transmission business (i.e. the power lines and various paraphernalia that keeps electricity and gas shooting round the country). They have also increasingly built up their similar interests in the US. Being practically a monopoly, this is a very highly regulated industry. As a consequence, this is both a threat and an advantage. A threat as it means pricing power is greatly constrained. An advantage as it often means that earnings visibility are locked in for prolonged periods. The consensus represents a 4% growth in EPS for this year. And it provides us with a by no means overdemanding P/E ratio of 15.6. This is around the figure that the FTSE 100 is running at the moment. Even with the lowest EPS estimate we see a P/E ratio of about 16.5. Analyst predictions are also pretty tight. There is just 20% difference between the highest and lowest estimates. All is encouraging. All of this suggests to me that National Grid is currently trading at a pretty fair valuation. Certainly not bargain basement nor extortionate. It is certainly trading at a premium to its chief peers--Centrica and SSE--who are running at future P/E ratios of 14 and 13. However, the stability of National Grid in comparison represents a fair justification for this premium. Of course, one of the reasons for the recent price weakness has been National Grid's debt levels. With the possibility of rising interest rates, the significant debt-to-equity level of 2.18 is a little worrying. Even SSE and Centrica--other utility giants in an industry in which debt is less of a concern--have much lower levels. However, in keeping with the industry as a whole, National Grid is a lucrative income holding. For this year and next analysts expect a dividend growth rate of about 2%. This would throw out dividends of 43.16p per share and 44.37p per share for this year and next. These dividends would represent a yield on cost of 4.94% and 5.08%. These are very good figures indeed. Some other utilities offer a higher yield (such as Centrica and SSE) but with--in my opinion--greater risk. What is more, most utilities are still offering yields far below National Grid: Pennon Group, Drax, United Utilities and Severn Trent, for example. As such, NG looks excellent indeed. NG have also stated they intend to grow the dividend by at least RPI for the "foreseeable future". This is an important intention and should defend my dividend income a little from the worst excesses of inflation. The dividend cover is a little thin. Assuming consensus EPS and dividend predictions are right we should see dividend cover running at 1.29 times earnings this year and 1.31 next. However, this is the norm in the utility sector where reliable earnings mean that less cash is needed to be retained. What is more, again NG sits very well amongst its peers. All the above mentioned companies (except Drax) are set to have cover thinner than NG. Furthermore, even assuming lowest EPS predictions alongside current dividend predictions we should see the dividend at least covered at least by earnings. Not something that all the other companies can claim. There are a couple of other things which I will be keeping an eye on. Since 2009, NG has seen its cash reserves drop by about 17%. Over the same time, debt has risen by about 0.8%. The debt rise is not too much to be worried about at that rate. However, it would be good to see the cash reserves bolstered a little going forward. So how does NG fit in with my goals for 2015? Pretty well, in general. It certainly helps me attain a portfolio yield of 4% or more. With a yield around 4.9% it is very healthy indeed in this regard. What is more, NG is a relatively low volatility stock. With a Beta value of about 0.3 it contributes nicely to my goal of having a portfolio Beta volatility of 0.85 or less very nicely indeed. Similarly, as a new holding it brings my number of holdings to 23 or my target or 25 or more holdings. As an added bonus, it has also made the utility sector my 6th largest portfolio sector as opposed to 8th largest as it was previously. My recently added target of reducing charges to 1.3% of total cost or less is certainly not hindered by my NG purchase. Trading fees amounted to 1.3% of the total cost altogether. Certainly, I would like this to be reduced further, but it is progress nonetheless! NG will also be useful in contributing to my £800 dividend income total for 2015. Although I have missed one payment for this calendar year (paid in January), I will receive the Final dividend in August which should be about £20. As another added bonus, the January and August dividend payment dates fall in currently very quiet dividend months for me (see January 2015 and August 2014 income, for example). Not very important, I know, but quite satisfying nonetheless. Overall, I am very happy with my NG purchase. I expect for the price to be a little more volatile than usual over the next few months as the elections push the party leaders to bash the utility sector. If a significant drop does occur I may consider beefing up my holding. However, in the meantime I am happy enough opening a position at this reasonable level. You bought NG for a reasonable price. They are currently 883 pence after a small drop in SP today. I am hoping they drop a little more so that I can get more shares for my money. Thanks, Laura. Yes, I did ok with the price at the time. They dropped further shortly after I bought it. If they continue to drop I may put it back on my watchlist. Very solid company in a highly defensive industry. Worth a space in anyone's portfolio.